In the beginning, birding apps were all about sound—bird songs, bird calls. And it was good and convenient, especially during spring migration. The text on birding apps was pretty much like reading a field guide. In many cases it duplicated a print field guide, which was fine, because a field guide on your phone was still a lot lighter and more convenient than a book in your pocket. Then came the realization that apps could present information in ways not remotely possible for the artifact known as the book. And we had links and filters and quizzes, and it was good and convenient and fun too. 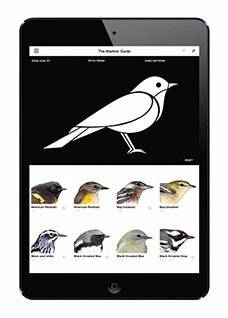 And, we kept wondering, “What’s next?” Well, one next-thing is The Warbler Guide App, a mobile computer application that has taken the rich content of a groundbreaking print identification guide and re-conceptualized it into a new product that is convenient and educational and more fun to use than any bestselling computer game. If you’ve been following The Warbler Guide App Blog Tour, of which this is Day Five, then you know that the app is the innovative brainchild of Tom Stephenson and Scott Whittle, authors of the The Warbler Guide, which was published by Princeton University Press in 2013, and The Warbler Guide Song and Call Companion, which came out a few months later . 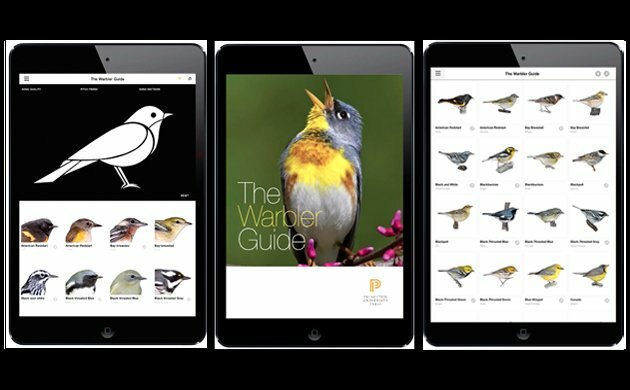 The App offers most of the content of The Warbler Guide—species accounts, photographs, songs and calls, and diagnostic clues to identification of the 48 wood warblers found in the United States. But, it is NOT a direct transfer of the book to a digital format. (There is an eBook version of the guide available, if that is your preference.) Tom and Scott have apparently sat down and told their programming team that they want birders to be able to access Warbler Guide information in as many ways possible with as few clicks or swipes possible. Also, that they want birders to see warblers in 3-D. And, that they want birders to be able to figure out what bird they are looking at by filtering the possibilities by color and feature and pattern. Done. Done. Done. 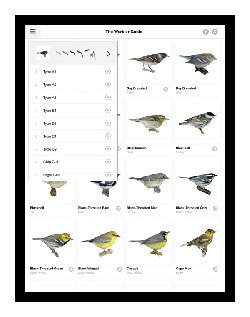 The app opens up with the Finder Page, showing all North American warblers (once you scroll down) commonly found in the United States and Canada. As in The Warbler Guide, certain species are shown separately, in their “bright” and “drab” forms. Click on the menu link in the upper left-hand corner, and you are presented with possibilities. You can view the birds in Side View, Face view, three-quarter view, Underside view, Undertail view, and in 3D. You can look at Spring/Summer birds or Fall/Winter birds. You can specify warblers of a certain geographic area: northwest, southwest, northeast, or southeast. You can order the images by Color Grouping, Alphabetical, or Taxonomic. You can combine possibilities: Images of undertails of fall/winter warblers of the northeast in alphabetical order. Faces of southeast spring/summer warblers by color. Lots of possibilities, lots of fun. The 3-D images are amazing, especially when you look at two birds together. (You can see a video of this tool on the ABA Blog.) It is a wonderful way to compare how two different species look at specific angles. You will know if that bird with the yellow underside and white undertail you’ve found on your Christmas Bird Count is a Wilson’s Warbler or a female Hooded Warbler, even if you can’t see the head. Clicking a bird image on the Finder Page brings up the Species Account, with tabs for Comparison Species, Overview, Songs, Photos, Age/Sexing, and Maps. At first, I was surprised that Comparison Species was the first screen I saw when I clicked through. Most field guides would take you to the overview section. I then realized that this is what you would want to see if you were trying to identify a bird in the field, especially if you were a beginning birder. Is it an American Redstart or a Black-throated Blue Warbler? You can look at that other “stuff”—physical description, diagnostic field marks, behavioral clues, habitat—later. That “stuff” is, of course, of prime importance. In my review of The Warbler Guide, I talk about the excellence of the species accounts. Every physical, identifying feature of each warbler species is presented in precise language, accompanied by appropriate, and usually beautiful photographs. This is all in the app as well. And, yes, the cute little icons for silhouette, color impression, undertail pattern, range, habitat, and behavior are also on the screen. The only item I found missing are the non-warbler birds that are sometimes included in the book as part of Comparison Species. Philadelphia/Warbling/Red-eyed Vireos, for example, are listed as comparison species for Tennessee Warbler. The App is warblers only. Song is a major part of The Warbler Guide, featuring sonograms of chip calls, flight calls, and songs illustrating pitch, trills, and buzzes. These are very easily accessed on the App. On the Finder Page, you just click on the musical note link next to the name of the warbler. Or, in the Species Account section, you click on the Songs tab. This is an improvement on using the book, because you can see the bird image, the sonogram, and hear the call or song simultaneously, creating a platform for learning and memory. You’re given the option of repeating the call over and over and over, or playing it at a slower speed. Filtering through colors and other features to identify birds is not a new concept; it’s used well in Merlin and the National Geographic apps, and I’m sure in other apps that I’m not familiar with. But, I do love to play with this filter, which is configured as a large silhouette of a bird divided into parts, sort of like a simple coloring book. I always loved coloring books. And Colorforms. Here, touching a part of the bird brings up a color palette with additional options for features like eyeline, cheek patch, wingbars, streaking, etc. You also have the option of filtering via song quality, pitch trend, and number of song sections. So: Yellow head–22 possibilities. Eyeline–12 possible birds. Song quality–trilled–Palm or Prairie Warbler. Pitch trend–rising–Guess the bird! I do wonder how well this would work in the field. It takes a little time and concentration and the ability to see your iPad or iPhone screen well, which isn’t always possible outside. However, I think it has a lot of potential as a useful tool, especially if you’ve taken notes or photographs and listened to the bird’s song carefully, noting qualities such as pitch and trilliness or buzziness. In fact, I think using this feature will force some birders, like me, to listen better. If all of these features seem overwhelming, they are. There is a succinct Help section in the App. The videos Scott and Tom have made, and which I imagine will be available on the PUP website, are very helpful. I hope they make more, maybe giving case studies on using the features in specific situations. I think this is an app that will have to be used regularly to be used well. Some technical notes: The Warbler App is for Apple products only. It requires iOS 7.0 (Apple operating system 7.0) or a later operating system, and is compatible with iPad2 or iPhone 5 and above. For me, this meant it worked perfectly on my iPad2, but that I couldn’t load it onto my iPhone4s. It will be available through iTunes for $12.99. I examined a review copy received from Princeton University Press (thank you everyone who made that happen!) and had no problem downloading it or working with it once the download was complete. Two questions are going to be asked about this product: (1) Should I get The Warbler App if I already have the book? (2) I don’t have the book—which format should I get, book or app? I can’t give easy answers, I can only outline the differences between the two. The book has more substantial content. If you are interested in understanding bird song– exactly what sonograms are, the parts of bird song structure–then you need to get the book. If you want material on warblers not often seen in the United States (Crescent-chested, for example) and warbler-like birds (Yellow-breasted Chat, kinglets, etc. ), then you need to get the book. The book also has explanatory material on the parts of a warbler and how to look at a warbler, and features such as a glossary, a diagram of North American Warbler Taxonomy, and measurements. 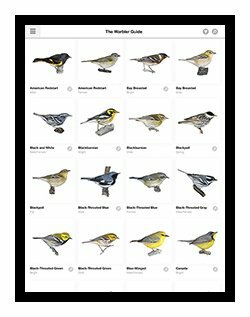 The app offers flexibility of access and multiple options for viewing and listening to warbler species, including options for comparison viewing and listening. The app also offers the filter function. At $12.99 it is less expensive, but its use is limited to those who own devices with the appropriate, up-to-date platforms. The app is lighter and more convenient than the book, as apps tend to be, making it much more useful as a field and travel tool. The app is delightful. The book is serious. In a perfect world, or in a world where you could ask some nice person for one or two gifts for the holidays, a birder could conceivably own The Warbler Guide in both formats. The pricing does not make this inconceivable. The app should be available for purchase through iTunes in a matter of days. And, then think of all the fun you would have come warbler time, in April (for you southern birders) and May. 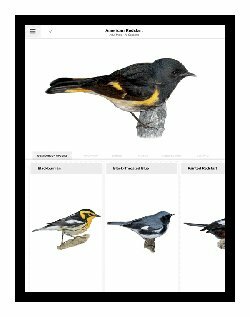 The Warbler App by Tom Stephenson and Scott Whittle. Princeton University Press, December 2014. $12.99. Requires iOS 7.0 or later. Compatible with iPad 2/iPhone 5 and above. As a postscript, I’d like to say farewell to Jessica Pellien, Assistant Publicity Director and ePublicity Media Manager for Princeton University Press. It is a publicity director’s job to get the right books to the right reviewer, but Jessica always did more. She was available to answer questions or get graphics to illustrate a review, no matter how last minute the request, and she coordinated blog weeks, like this one, with grace and patience. She clearly cared about her titles and her authors, and though she did not go into this job as a birder, she allowed us to steer her in that direction. Jessica is going on to a job at a different university press (that doesn’t publish nature books), and all I can say is Good Luck and Good Travels. any chance an android version will be forthcoming? I found this app baffling. It is loaded with content and that is great. I like the 3D effect where you can spin the bird but I didn’t like that the drawings are so small. But the UI is very difficult to use. It could benefit form a makeover and simplification. I can see why the reviewer called it like a game. The thing is when I am in the field I don’t have time to figure out how to use an app, it just has to work. So for now I would not recommend this app. I think owning the book is a good idea if you want to become proficient at Warbler ID but the app is just too expensive and too complicated. Jean, I sent your question to Tom Stephenson, and will let you know when his reply. Otis–thanks for the input. I’m not sure what drawings you’re referring to, since photographs are used to depict the warblers. Maybe the emblems showing habitat, behavior, etc? I agree that it takes a little practice to use the app in the field, which is why I recommended the videos Tom and Scott have made. I found those very helpful, and it only takes a couple of minutes ot watch them. I really enjoy the graphics of the app, I think it was well put together in my opinion. Marge Cahak Gibson: Can Nature Take Care of Itself?